Save the date! The businesses on 104th-St. are coming together on Tuesday, December 4 to say a collective “THANK YOU!” for your support throughout the year. Please come visit us and enjoy the many special offers and activities provided by the following merchants and restaurants for your holiday festive season pleasure. We wish to say a collective Thank you to the residents and visitors to our street for your year round support. Without you, our valued customers, we would not be here! deVine Wines & Spirits (4 PM to 10 PM), 10111-104th-St.
·	10% discount on all in-stock regularly priced wines and spirits (in store shopping only and no rain checks) – excludes beer and wines stored in our vintage keeper/vintage room and special cases of the month. Please contact the individual businesses below if you require further information. 104st Grill (all day promotion), 10190-104th-St.
Blue Plate Diner (4 PM to 10 PM), 10145-104th-St.
Blunt Salon (all day sale), Icon II Tower, 10142-104th-St. Bubble Buzz (all day sale), Icon Tower II, 10140-104th-St. Carbon Environmental Boutique (all day sale), 10184-104th-St. The Cask and Barrel (4PM to Close), 10041-104th-St.
Coup (garment boutique) (all day sale), #101, 10137-104th-St.
Credo Coffee (all day promotion), Icon Tower I, 10134-104th-St.
Dauphine (all day sale), 10129-104th-St.
Evoolution (all day sale), Icon Tower I, 10130-104th-St. Eye Care Group (all day sale from 9 AM to 9 PM), 10360-Jasper Ave. The Helm Clothing (all day sale), 10125-104th-St.
Lit Wine Bar (6 PM to Close), Icon Tower I, 10132-104th-St.
Mercer Tavern (all day promotion), 10363-104th-St.
Pangaea Market (all day sale), 10150-104th-St.
Roast Coffeehouse + Wine Bar (all day sale), 10359-104th-St.
Tony the Tailor Ltd. (all day chance to win), 10172-104th-St.
Tzin Wine & Tapas (all day sale), 10115-104th-St.
Want to spread goodwill and cheer this holiday season? Looking for a sure-fire way onto Santa’s “Nice” list? Why not volunteer for the Downtown Business Association’s 25thth Annual Jingle On Indoor Santa Claus Parade on Sunday, December 2! We are filling 150 volunteer positions including Marshals, Pacers, Parade Security and Banner Carriers. It’s a one-day, 6-hour commitment (plus Volunteer Orientation). All volunteers will receive a t-shirt, training and a chance to win fabulous draw prizes at Volunteer Orientation Night. thousands of children happy on Sunday, December 2! Colourful floats, mascots, marching bands, theatre groups, dancers and others will jingle their way through Commerce Place, Manulife Place, and Edmonton City Centre Malls. The highlight is the arrival of Santa who takes a break from the North Pole for a pre-Christmas visit with all of Edmonton’s good boys and girls. Free candy for the kids. And best of all, you don’t have to worry about the weather! Visit edmontondowntown.com for more information on this event. To volunteer for the Jingle On Indoor Santa Claus Parade, go here..
We’ve been planning for quite some time a glorious week of celebration of the wines of Portugal which begins with the Portuguese Wine Festival on Tuesday, November 13th at deVine’s from 7pm to 9:30pm! Winemakers and/or winery representatives from several Portuguese wineries will be here to talk wine with you on a personal level. Sample over 20 different wines, beers and liqueurs which will be served by the representatives. Not very often will you have an opportunity to rub shoulders with this many winemakers. To make it even more enticing, all in-stock Portuguese wines will be discounted 10% that evening for the attendees of the festival. Tickets are $30 each and can be order by phone – 780-421-9463 or online here.. Feature Winery – One of the feature wineries at the festival is Fita Preta Vinhos and co-founder and enologist Antonio Macanita. Producing “highly individual wines with a distinctive Portuguese character” has been the motto of Macanita and co-founder David Booth (who unfortunately passed away suddenly earlier this year). The winery is located in the Alentejo region, a large province in the south of the country, lying between the cool waters of the Atlantic Ocean and arid interior of southern Spain. The combination of poor rocky soils and the 3000 hours of sunshine per year, low summer rainfall ensure grapes mature fully producing wines that have a distinctive fruit character and represent a true expression of the terroir. 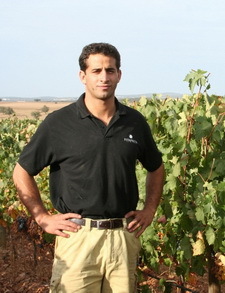 Macanita has worked with leading wineries around the world (Merryvale and Rudd in Napa, d’Arenberg in McLaren Vale, and Chateau Lynch Bages in Pauillac). Please join us next tuesday and sample several Fita Preta wines, and to say hello to Antonio, one of many winemakers at deVine’s that evening. A Winemaker’s Dinner with matching wines will then be held at Sabor Divino on Wednesday, November 14th – book your tickets here.., followed by the very popular Annual Roy Hersh Port Tasting at the Royal Glenora Club on Friday, November 16th (already sold out). Please make every effort to join us for one or all of these events during this festive week in celebration of Portuguese wines and culture.